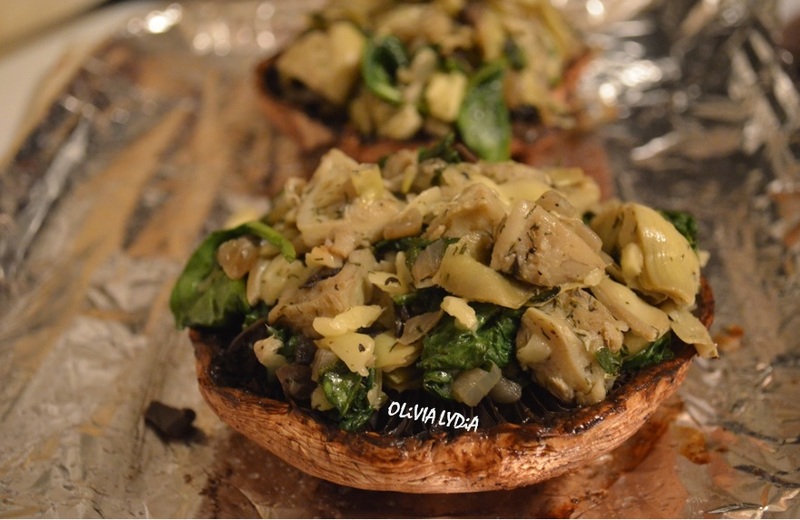 Artichoke Stuffed Mushroom – Olive For Greens. It’s artichoke season! And boy of boy do I love artichoke! Artichoke are high in fiber and antioxidants. Artichoke are also good for liver. Some even believe it cures hangovers, so try this the next time you have one too many glasses of wine! They are lemony and versatile. Most restaurant bread them and fry them. There will be none of that here! 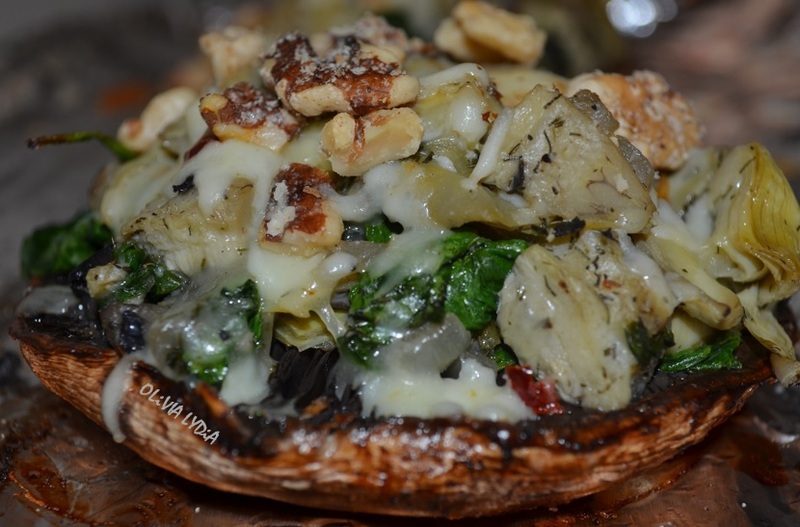 When I discovered I loved mushrooms, I starting experimenting with different ways to stuff them. 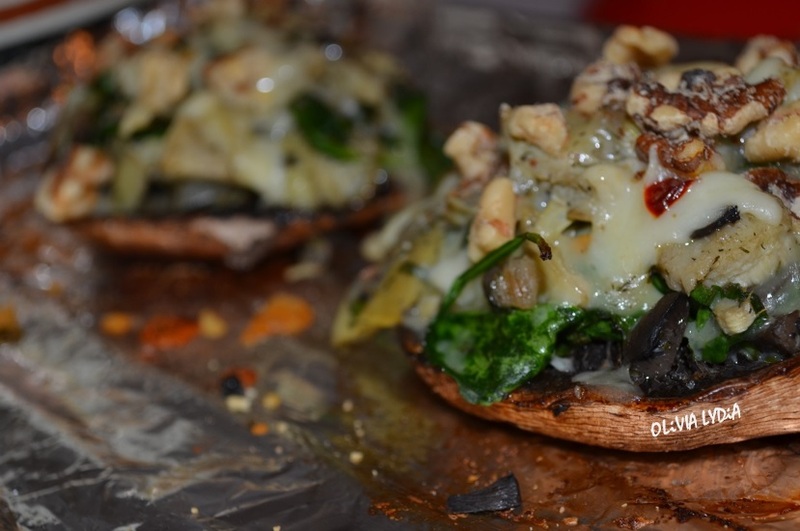 (Check out another one of my stuffed mushroom recipes here!) Though I love them all, this recipe is my favorite so far- but I might be bias because I love artichokes so you decide! This recipe is low-carb, vegetarian (with vegan option) & gluten-free. Add olive oil, onion and garlic to pan. sauté until slightly golden. Add the dill, salt, pepper and artichoke. Sauté on low for about 5 minutes. At this point place the mushrooms cup side down on a baking sheet and bake for 5 minutes. In the pan, now add the artichoke water and spinach. Sauté until the spinach is slightly wilted. After 5 minutes, remove the mushroom from oven flip cup side up and add the stuffing. Top with cheese and walnuts then place in the oven for another 5 minutes.